In the course of organizing BarCamps in different cities of Kosovo, this time the BarCamp team hit the road with an event in Gjilan. The first edition of BarCamp in in this city was organized in joint cooperation with UNDP Smile. 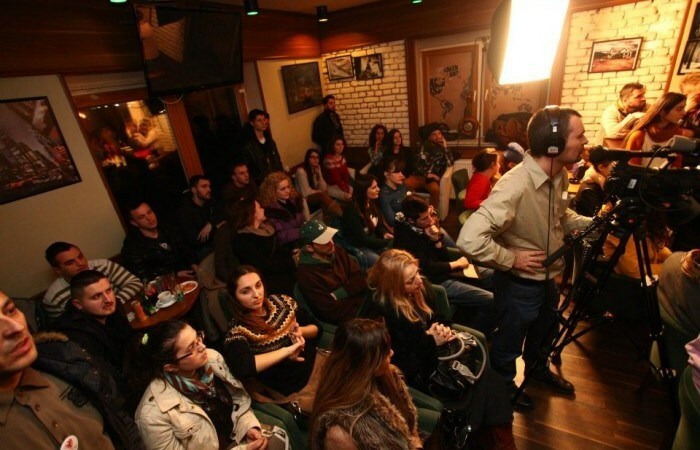 Around 80 participants attended this event at the small and cozy “House Bar”, and they had the chance to see two presentations from Trim Kadriu, founder of mesofizike.com, and Faik Ispahiu from Jeta në Kosovë. Awarded by the European Project Association (EPA), a European Union Organization, the virtual lab mesofizike.com was the key subject and the reason why Trim Kadriu was invited on this BarCamp edition. Talking about his experience on building the virtual physics lab that covers 30 experiments built in Flash, Trim pointed out that this project would have been just a dream without Unicef Innovations Lab financial support. He used the BarCamp stage to demonstrate three experiments as examples on how mesofizike.com works. He also emphasized some possible extension options in other fields as well like medicine, chemistry, etc. It took more than half an hour for Faik Ispahiu to present his project and answer all the questions that arose from the audience. The media team from Gazeta JNK was also present to record the whole event, while Faik was talking on how people can use social media to tackle social challenges, to report corruption, the misuses of budgets, etc. He explained to the audience the reason behind meetings with municipal leaders in Kosovo, how they are trying to better integrate kallxo.com, as a corruption reporting tool within the municipalities websites across Kosovo. Faik challenged the audience to come up with a solution on how to measure the performance of all the teachers across all schools of Kosovo, while trying to find solutions that minimize misuses and that protect the pupils/students. In an open discussion with the audience, there were some questions on how can the trust be challenged if kallxo.com works with municipalities, and Faik responded that people need to believe in their country, they need to believe in their institutions, which means that they must start to trust and give the tools to their governors to make the life’s of the citizens better. According to Faik, it’s not up to him to fight the crime and the chances of winning elections out of steeling are getting lower and lower, so things have to change.